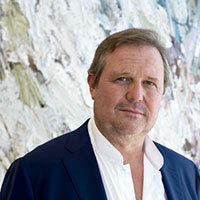 Tim Olsen is one of Australia's most recognised and respected art identities and successful gallery owners. Son of Australia's national living treasure, artist Dr John Olsen, A.O. O.B.E., Olsen was born into a life of modern and contemporary art, and through fortitude and adversity has forged his own path, successful career and has become a highly recognised Australian over the past three decades. Olsen was born on the 6th May 1962, after living in Europe as a small child, Tim was educated for secondary school at Cranbrook from 1973 - 1974 and completed his studies at the Kings School from 1974 - 1979 where he was also recognised as a competent athlete. His formal tertiary education began with a diploma of Visual Arts, majoring in painting and print making at the National Art School, Darlinghurst from 1981 - 1984. From 1984 - 1987 he was awarded a Bachelor of Education (Visual Arts) at the University of NSW, College of Fine Arts. During this time he afforded his education by working in some of Australia's leading restaurants under the mentorship of such names as Gay Bilson and Anders Ousbach. It is under these people he refined his talents in social skills, presentation and further aesthetics. Tim Olsen has also worked in and managed many leading Art Galleries including Rex Irwin Art Gallery, Woollahra; Australian Galleries, Collingwood and Paddington; and Roslyn Oxley9 Gallery, Paddington. He established his own Gallery in 1993, which has rapidly expanded to become one of Sydney's leading galleries today, marking his contribution and commitment to the Australian art scene. He not only has supported the careers of many of Australia's leading established artists but also has nurtured the creative lives of many emerging artists who can presently include themselves as being very much part of the art establishment today. By 1993 Tim Olsen had opened his own Gallery in Paddington Street. He opened the Annex Gallery in Windsor Street in Autumn 2002 and Queen Street Gallery in 2006. In June 2007 Olsen consolidated his Paddington Street and Queen Street Galleries into one major exhibition space at 63 Jersey Road, Woollahra, in to one of Australia's leading art institutions. The annex was transformed into the Tim Olsen Works on Paper Gallery, in tribute to his passion for works on paper. Tim's philosophy is to support artists that embrace the traditional practice of drawing and painting as a timeless and pertinent medium today. Consequently many serious collectors and institutions are still acquiring these artists work as part of their otherwise conceptual contemporary collections. Representing over 40 artists, Olsen has established himself as a leader in Contemporary Art, with a client base extending throughout Australia and the world. Tim has also humbly and quietly gone about his passion for philanthropy. Tim is constantly being invited to judge and award various art prizes throughout Australia. Often he is called upon by the media as an informed commentator on many issues associated with the arts. He has been a foundation member of the AGNSW for over 15 years and is dedicated to its restoration department and also a major donor and benefactor to the MCA. Tim Olsen has been a patron of the King's School Art Prize for over twenty-five years and since 2000, sponsored the annual Tim Olsen Drawing Prize at UNSW, School of art and design. He is on the foundation board of the University of New South Wales, which includes some of Australia's most influential academic leaders and captains of industry and culture. He was also recently invited onto the board of the National Art School in East Sydney. Tim constantly and selflessly, in these honorary positions, strives towards improving the lives of under privileged students and in turn, opportunities for those who are otherwise out of the reach of further education. Tim has been strongly associated with many charities directly and is constantly donating the gallery itself for fundraising events that include the Royal Randwick Children's Hospital, the St Vincent's Hospital Curran Foundation through to Oxfam to name a few. Over the years Tim has generously donated hundreds of thousands of dollars worth of artwork to the many charities including the Randwick Children's Hospital to not only raise money for vital equipment, but also to brighten and enhance the hospital environment for many sick children. As a creative business visionary he was recently invited to join EO (Entrepreneurs Organisation) a selected forum of leading entrepreneurs. Today, Tim is considered an eminent Australian in his own right, aside of his father John Olsen and his sister Louise, who is a leading designer and owner of Dinosaur Designs. Despite being a member of the Olsen dynasty, he has embraced the art world in his own individual and unique way, which has contributed and influenced directly and indirectly, the many lives that surround him and in turn he is recognised as being an important part of Australian culture for now and in the future. With all these things in mind, I am most rewarded in how in it's many ways I have been able to enhance the quality of life, for not only the receptive, but also most importantly and through my specialised philanthropy, the underprivileged."